Since its founding in 1938, the Society has championed the preservation of historic buildings. With modest resources, the organization has managed to preserve and restore 17 of Wilton’s diverse 18th- and 19th-century structures, which otherwise would have been demolished. It began with Lambert House, Wilton’s oldest extant dwelling, at the intersection of Route 7 and Route 33. Purchased in 1965, it served briefly as the first headquarters and museum for the Society. In 1970 it was decided to move those functions to the old Fitch Homestead farther north, across from the Town Hall. At the same time, the State offered to move Kent School and the Lambert Cottage to the Lambert House site instead of bulldozing them for a highway. 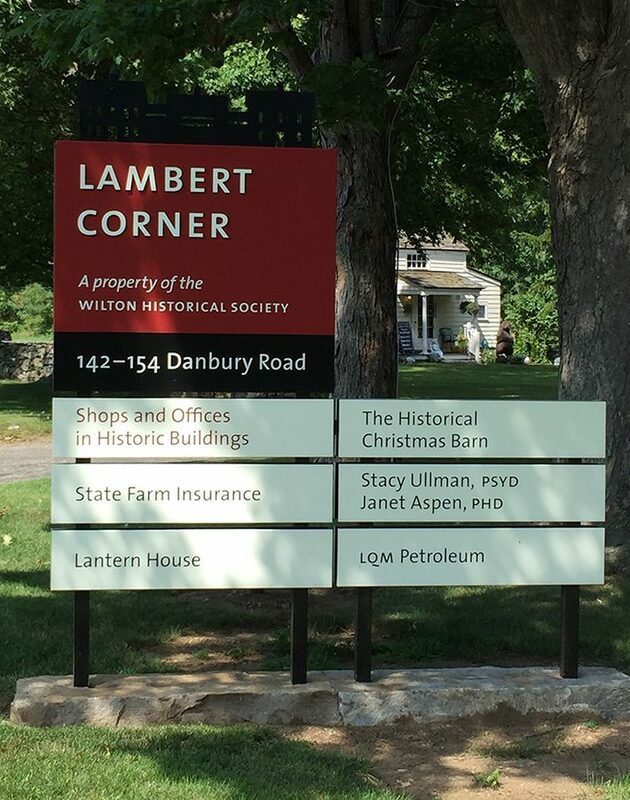 Since then, the complex known as Lambert Corner, owned and operated by the Wilton Historical Society, has grown from one original house to a nine-structure complex of 18th- and 19th- century Wilton buildings, and comprises Historic District #1. 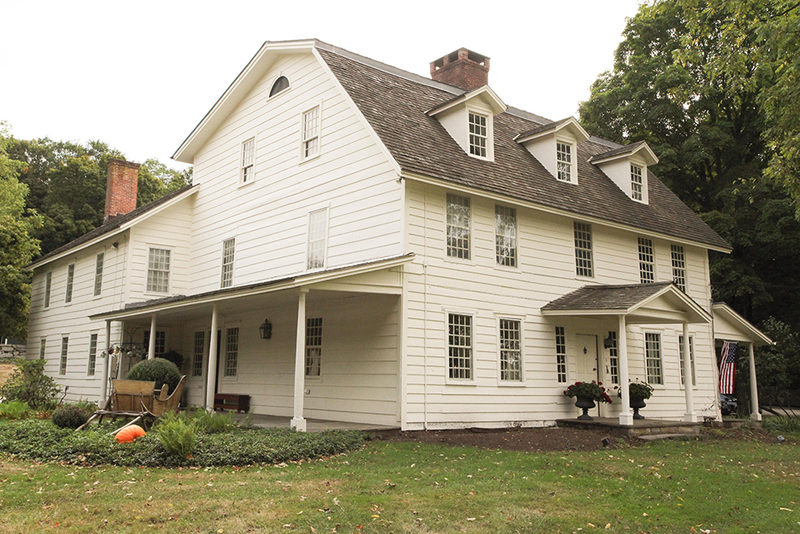 Together with Cannon Corner, another adaptive reuse project, and the Wilton Historical Society’s Museum Complex (Historic District #5) at 224 Danbury Road, the three campuses are examples of historic preservation that helps keep the unique character and history of Wilton alive. Adaptive use, the concept of using old buildings in new ways, allows commercial use to provide income for restoration and ongoing maintenance. First utilized in Wilton at Lambert Corner, it has been incorporated into the town’s Zoning Code. Adaptive use has successfully preserved many buildings along Danbury Road, avoiding zone changes and more commercial strip development. Wilton was in the forefront of the adaptive use movement in the 1970s; it has been a prime mechanism to avoid further destruction of the town’s character. Lambert Corner (150 Danbury Road) serves as a bucolic gateway to Wilton, with nine historic buildings scattered around the 3.5 acre site. All the buildings have been professionally restored to code standards and most are self-supporting. They contain retail stores, offices and apartments. 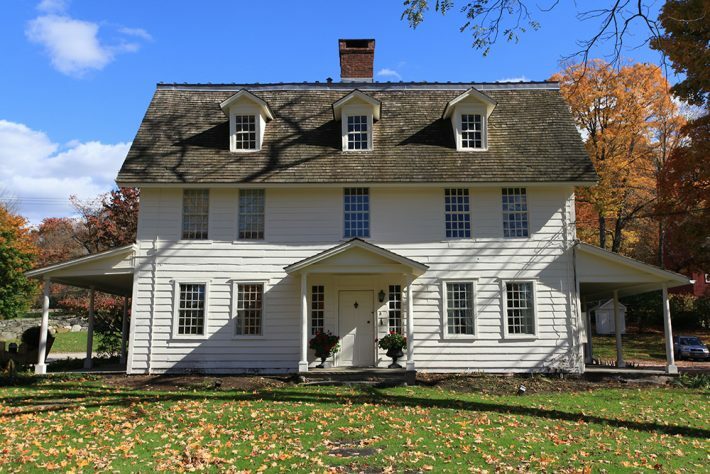 The Wilton Historical Society pays both property and income taxes on its adaptive use properties. The restored buildings provide a vision of a rural Connecticut town, showing facets of 18th- and 19th- century life in a typical New England community. The story of Lambert Corner began in 1962, when a group of concerned residents requested that the Board of Selectmen create a Study Group to research the possibility of creating a local Historic District. Nelson Breed, a highly respected local architect, was appointed chairman. In May of 1963, the committee recommended the establishment of Wilton Historic District #1 “to consist of the original Lambert homestead, now ‘Lilacstead,’ and the originally appurtenant building” located on the island intersection of Routes 7 and 33. The Town Meeting voted to accept the proposal in the fall of 1963. At almost the same time, the Wilton Historical Society had been looking for a site to house its headquarters, and in 1964 when the Lambert House was offered for sale, it was purchased. As the Society’s needs and visions grew, so did Lambert Corner. Each of the nine historic structures has been professionally restored and most are used commercially in order to pay for their preservation and to help fund the Society’s Museum Complex and a wide variety of exhibitions, lectures and programs. The Lambert house is believed to be the oldest house still standing in Wilton. Constructed by David Lambert c. 1726, the house serves now as the centerpiece of the current complex of nine structures at Lambert Corner. It was purchased, on a little over three acres, by the Wilton Historical Society in 1964, to serve as its first permanent headquarters. The house was undoubtedly much smaller originally and has undergone many changes over the Lambert years and subsequently under the ownership of Royal and Ruth Kellogg. Two rear wings were added as the wealthy Lambert family needs expanded; the north wing in pre-Revolutionary times and the south one early in the nineteenth century. Although the Lambert family accumulated wealth and real estate in the early years, their fortunes declined by the middle of the 19th century. Near the end of the century, the house became the Lambert Academy for Boys. In 1897 it was the scene of a brutal and sensational murder when Professor David S. R. Lambert was shot by a former student, who then stole Lambert’s wagon and fled with a companion, both of whom were later captured and tried. The house remained in the Lambert family until 1928. It then passed briefly through two owners and was purchased by Royal Kellogg in 1931. He transferred the ownership to his sister Ruth Kellogg in 1938. The Kelloggs added some garages and made other minor exterior changes. Through the Kellogg years, the interior was modernized; bathrooms were added, and heating and electrical equipment were updated. At some point in the long history of Lambert House, the roof was raised on the third floor, but when that occurred is unknown. Known as “Lilacstead” for many years, the Lambert property had lovely gardens and lilac bushes to the front and southwest of the house. Some lilac bushes can still be seen on the property. After the 1964 purchase from Ruth Kellogg, the Wilton Historical Society established its headquarters in Lambert House. Lambert House is depicted on Wilton’s Town Seal. 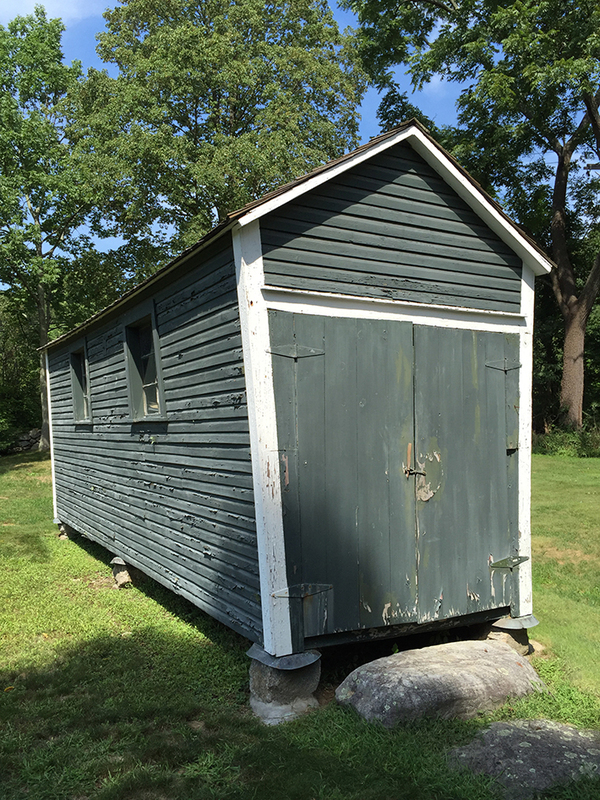 This small, well-proportioned saltbox style building was constructed in the first quarter of the 19th century, in the triangle of Routes 7 and 33. 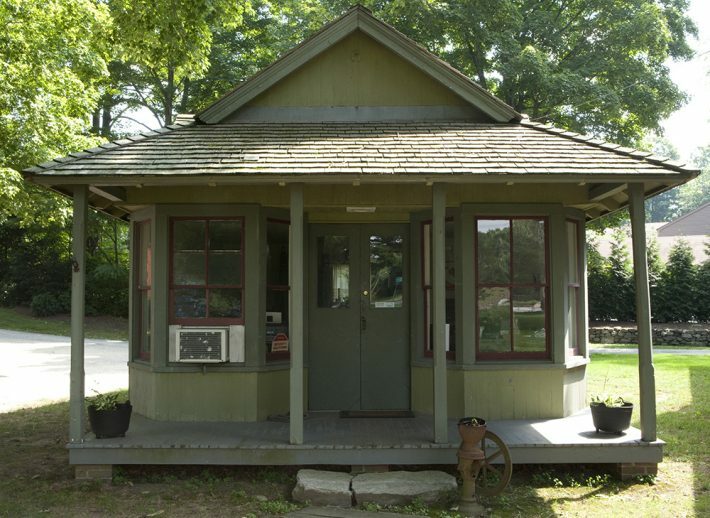 The cottage was moved a short distance to its present location in 1971, when the State of Connecticut was widening and redesigning the intersection. On the outside, the building has remained unchanged since it was acquired by the Wilton Historical Society. On the inside it has hand-hewn beams, sloping ceilings, a sleeping loft reached by a stairway, and a cellar. When it was moved, the chimney was moved as well. This offered a challenge – that of building a new foundation without disturbing the existing chimney. The cost of the relocation was paid by the State of Connecticut. All other restoration funds for the eight buildings on this site have been provided by the Historical Society, with the sole exception of a new roof on the cottage, paid for by the Town. Perhaps first used as a tenant space for a Lambert employee, the cottage has since been a real estate office, a travel agency, and a professional office. The one-room Greek Revival-style Kent School, District #6 (of ten school districts in 19th century Wilton), was built about 1843, north and west of its current location, in what is now the Orem’s Diner parking lot, next to Bryant’s Brook. After the school closed in the spring of 1929, the building was used by the YMCA for classes and later as the Wilton Athletic Club headquarters. This building was moved in 1971 and has undergone some changes. The chimney was placed on the exterior to provide more interior space. The schoolroom has a wonderful barrel ceiling, although we don’t know whether that was part of the original construction. At the time of the move, a new basement was built, accessed by a spiral staircase at the front of the building. There are four mullion windows, of which three are original. Several well-known local architects have — at various times — taken part in moving and renovating the building, including Bob Faesy, Willis Mills and Rob Sanders. 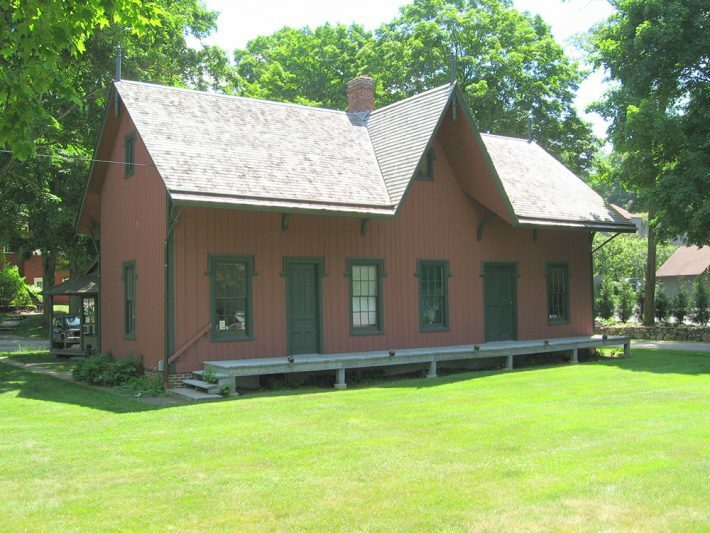 The Wilton Railroad Station was built in 1852, following the completion of the passenger and freight railroad line between Danbury and Norwalk. This first building was located on the west side of the tracks, to the north of the present station. The building continued in use until it was replaced with a new one on the east side of the tracks, in 1941. In 1941, Charles Dana bought the old station, moved it to his property along the Norwalk River, and converted it to a summer entertainment cottage. In 1968 the Town of Wilton acquired the property, at which time the building was in an advanced state of disrepair. On the verge of being demolished in 1974, it was saved by the efforts of an informal preservation committee. 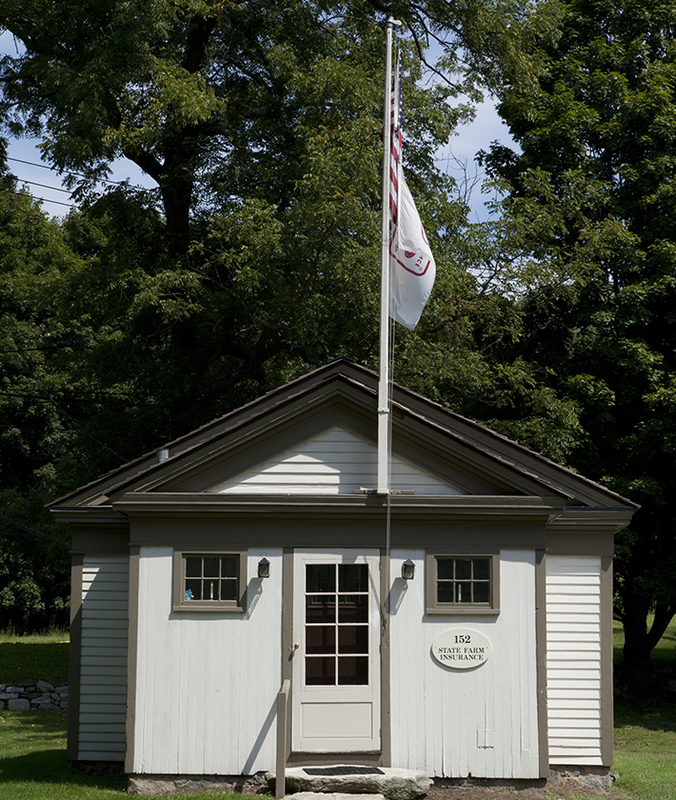 Four years later, the Wilton Historical Society dismantled and carefully rebuilt the station in its original architectural style on the Lambert Corner property. In 1964 Wilton native Robert Carvutto had purchased the Clarence Shipman property on Hurlbutt Street. 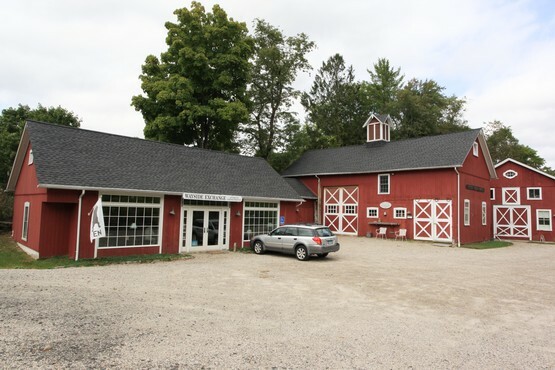 Carvutto donated and moved a small general store building from his property to the Wilton Historical Society, to be included in its growing complex of restored eighteenth and nineteenth century structures. The little store was originally owned and built by Hawley Bedient around 1889, and run by his brother James, who also became the postmaster. The post office was established in 1891 to accommodate the heavy volume of genealogical correspondence to and from another Hurlbutt Street resident, David H. Van Hoosear. Rural Free Delivery was established in 1899, and the Hurlbutt Street Post Office function was discontinued in 1901. William Barrett took over the store from Bedient in about 1913 and operated it as a “Feed and Groceries Store.” After Barrett’s daughter Ella married Fred Bennett of Hurlbutt Street, Fred and his identical twin brother Frank jointly operated the store as a meat market. Fred ran the store, and Frank delivered the meat around town in his wagon. Finally, Ernest Bennett, son of Fred, owned and ran the store until it closed. The Cannon store represents one of Wilton’s earliest documented general stores and is one of the few surviving commercial structures of late-eighteenth century origin in Connecticut. Rarer still, the store was virtually in its original state, having been used for storage once it stopped functioning as a store in Cannondale around 1860. Several generations of the Cannon and Miller families maintained the building in good condition. The store was donated to the Society by Trygve and Muriel Hansen, owners of the home of David Miller, whose mother was Esther Cannon. The building was moved, as a complete structure, to Lambert Corner in 1990. The general store was founded by John Cannon Jr. (1752-1802), known as “Doctor” Cannon because of the medicines he sold. It later passed to his grandson Charles, after whom the Wilton area known as Cannondale is named. 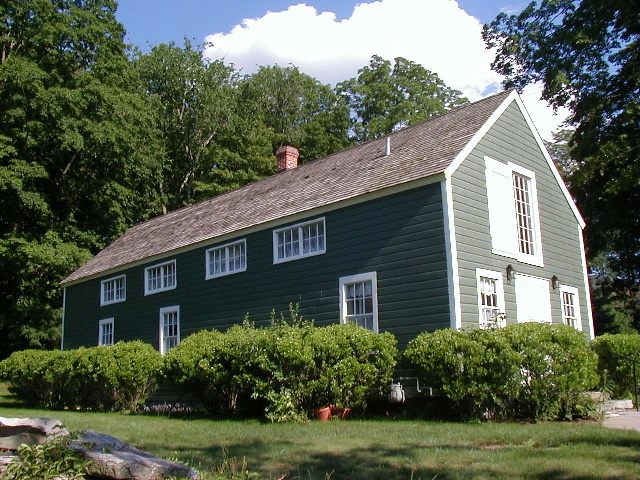 In addition to running the general store, Charles Cannon managed the family’s 167 acre farm, employed local women to make clothes in their homes for sale in the store and elsewhere, subcontracted the building of the Danbury and Norwalk Railroad through Cannondale, and “unofficially” managed the D & L Lockwood Brass Wire Mill. He also held a number of public offices. Cannon’s daughter married Samuel Miller, president of the Gilbert & Bennett Manufacturing Company (1818-1998). The historic Cannon general store building, taken together with the history of the Cannon and Miller families, makes this addition to Lambert Corner a very significant factor in the history of Wilton. Like the railroad station described earlier, this building came to the Historical Society from the Charles Dana property, following his death in 1975. It is believed to have been originally built by George A. Davenport (1808-1894), who was a Wilton judge and the grandson of Deodate Davenport (1730-1808). The Davenport family, in the eighteenth and nineteenth centuries, was one of Wilton’s premiere families; they held their extensive property until 1940 when it was sold to wealthy industrialist Charles Dana. 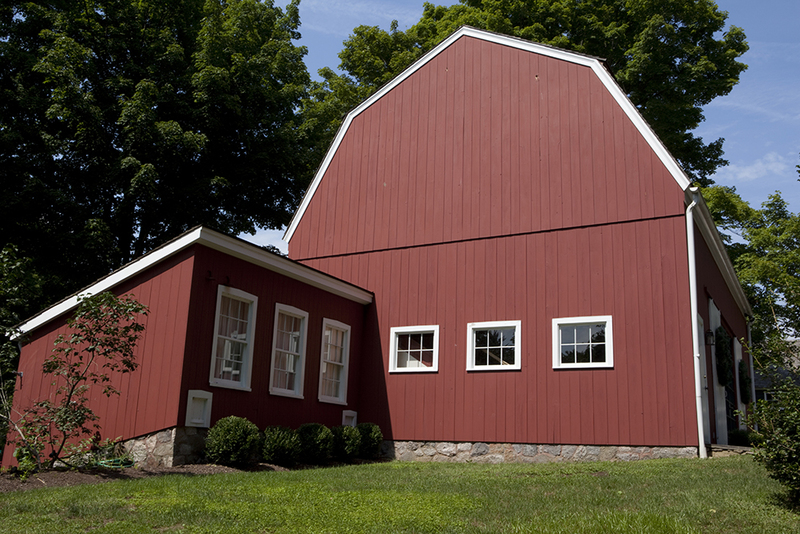 The barn was constructed about 1860 and features a gambrel roof, which almost doubles the loft storage capacity. While it originally had ladders to the upper lofts, stairways were added and the structure strengthened when the barn was dismantled and moved to Lambert Corner in 1989-1990. In the reconstruction of the extension to the south, small doors were left in place, having served at one time for the comings and goings of the owner’s chickens. Another original feature, which remains, is the roller entrance door, which is still in place but permanently anchored to the wall, in compliance with current regulations. Built about 1890 and moved to Lambert Corner from the Cannon family property, the building interior was originally divided into two sections: the front one for the processing of corn as it was brought in from the fields and a second area, at the back, slatted to permit the corn to dry. Every little farm had to put up at least 20 bushels of corn to feed one or two animals; this one may take 30 or 40 bushels. It is all hand-hewn and is a great structure. 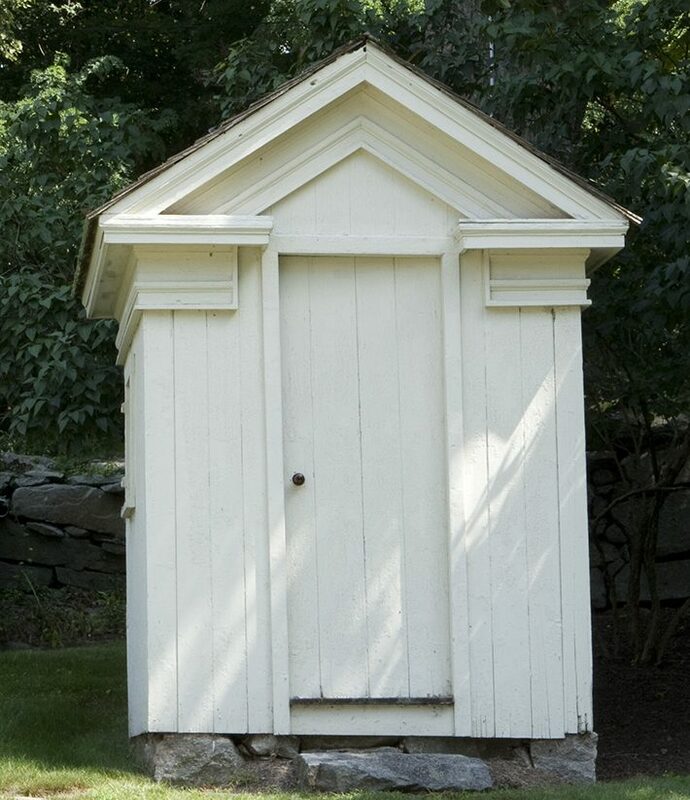 This stylish outhouse came from the property of Judge George Davenport, at the same time the Davenport Barn was relocated to Lambert Corner (1990). 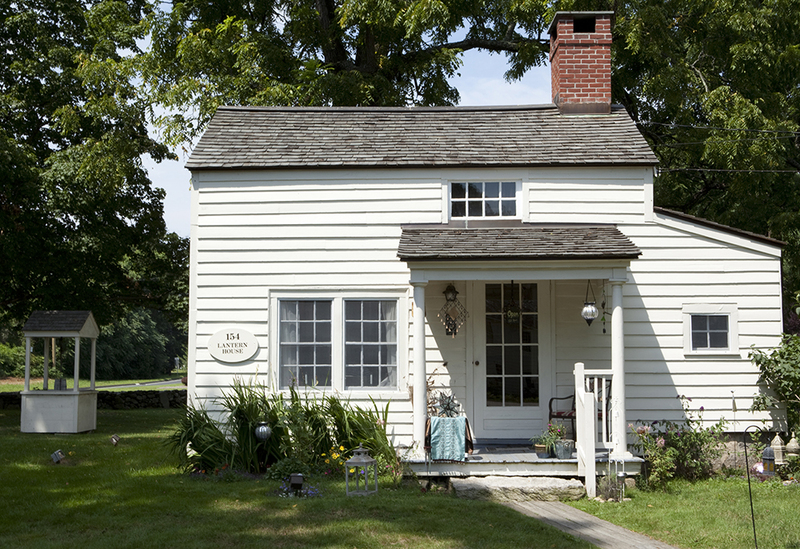 Built about 1830, the exterior of this little building is constructed with heavy cornices, in the Greek Revival architectural style. The interior has three seat openings, one of which was designed for a child as it has a smaller opening and step stool in front. Cannon Corner (corner of Danbury Road/Route 7 and Olmstead Hill Road) serves as an historic entry point to Wilton from the north, and is in the heart of the Cannondale National Historic District. The Society, with the help of the Connecticut Department of Transportation, has transformed once run-down garages, and 19th century barn and blacksmith shop into an antiques shop, a woodworker’s studio, an office suite and residential apartment.